Book News: Our black & white softbound manual for Tarot of the Holy Light has launched! The book to accompany Tarot of the Holy Light is now available to you here. Scroll down below the ad for the deck to find the buy button for the book. 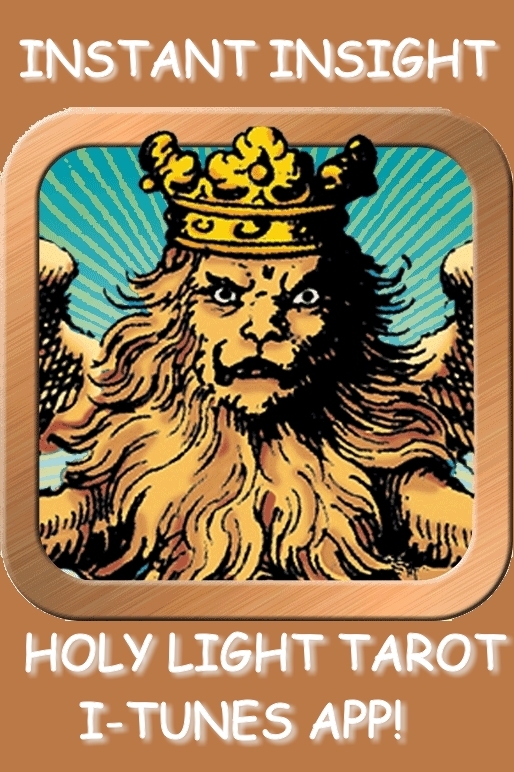 Tarot of the Holy Light, A Continental Esoteric Tarot. This is Volume 1 of a 2-volume set, the second of which will be entitled Foundations of the Esoteric Tradition. Together these volumes represent my response to a challenge that I was given during my tenure at the legendary Tarot forum TarotL. I originally stumbled into that venue after the launch of my first book, The Underground Stream, in the late 1990’s. The book launch coincided with the online appearance of the self-serve Tarot reading generator at www.Tarot.com. I was looking forward to the chance to travel and attend conferences, engage in enlightening discussions, and continue my research in company with others who love the Tarot as much as I do. Unbeknownst to me, a Sword of Damocles was hanging over my head, and it chose late 1999 to drop into my life and claim its pound of flesh. Life was forever changed by the neurological crash-and-burn process that took possession of me during the subsequent years. The consequences put me through a period of great sacrifice and struggle on many fronts, exactly the opposite of what I had been fantasizing and looking forward to. I was ultimately forced to turn my back to the Tarot world for quite awhile, steer clear of stress and learn to re-inhabit my skin in new ways. In fact, I am just getting back to my true center now. This bit of trivia is relevant because with this new book I re-enter the Tarot History discussion in a formal fashion once again. In doing so I return to the discussion citing the very same historical figures and emphasizing the very same evidence that I was pointing to all those years ago. But what a difference the intervening 15 years have made! Due to a welcome change in the academic climate, coupled with a plethora of new translations and fresh scholarly analysis, the bedrock of our esoteric paradigm has now been unearthed and is on display for all to see. There is now an embarrassment of riches that can be cited to buttress my long-held personal convictions. In The Underground Stream I asserted that there is a systematic body of thought standing behind the sudden burst of Tarot esotericism that surfaced in France the last decade of the 1700’s. This approach was already long-established among the Masons, Rosicrucians and Martinists before the time that Etteilla pinned it to the faces of his popular Tarot. The Egyptian-style Tarots of the 1800’s are a continuation of this older stream of Tarot mysticism. To keep it clear where these boundary-lines fall, I defined this historical stream as the Continental Tarot family, which appears with the first 78-card packs that embrace enumerated Trumps (mid-1500’s) and extends unbroken up to the cusp of the 20th century. The challenge I was given at the turn of the millennium was to write a scholarly defense of the Continental Tarots as an integrated movement. I was to look beyond any one pack of cards or outstanding personality, accounting for the sturdy underpinnings shared in common by all of the historical packs made in the Marseille-pattern (Trumps starting with 1 and ending with 0). Even in 1999, I recognized that the paradigmatic statement on Renaissance Magic, Marcilio Ficino’s Three Books On Life, represents one of several well-known sources for insight into the magical considerations animating Western occult speculations. Due to Tarot’s unique and accommodating bone structure, these considerations can be directly mapped onto the cards, enabling our beloved toy and tool to be useful to a philosopher of Ficino’s calibre. What I didn’t know in 1999 is that the Masonic stream that brought this philosophy forward into the 1800’s was empowered and enlivened by the alchemical and cabalistic synthesis erected by Jacob Boehme at the start of the 1600’s. To provide a window into what I’m talking about, I’ll highlight a few quotes from the excellent volume Hidden Mutualities; Faustian Themes from Gnostic Origins to the Postcolonial by Michael Mitchell (Editions Rodopi B. V., Amsterdam. 2006). I’m always delighted to find works like this, which take a synthesizing overview rather than specializing in only a tiny corner of the subject. Those who are familiar with The Underground Stream can see from Mitchell’s title that his book expands upon the territory that I was introducing so long ago. 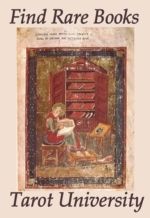 In fact, this potent volume provides a perfect context for Tarot of the Holy Light and the books that support it. I wasn’t able to get my hands on Mitchell’s volume until after I was finished writing the books we are just now bringing out, so it won’t be found in the Bibliography. Perhaps that is for the best. Mitchell’s presentation gives us a fresh look into to how fully we have misunderstood the evidence of history regarding the esoteric sophistication and subtlety of our magical ancestors. The soul, in other words, is the principle of attraction and connection. The World Soul as a whole is dispersed throughout the universe, creating, from ‘seeds’ of different types, different species, from stars through to living creatures and to the simplest of materials, and the World Soul also has the power of creating material forms corresponding to each other, from the higher to the lower. Souls are attracted to forms as divinae illices, or divine lures. Ficino sees the explanation for occult effects like the efficacy of medicines or the power of pagan images in these correspondences and deduces that it is possible, by using magic, to influence and manipulate the material world by their use. The De Vita Coelitus Comparanda, as Walker and Yates point out, contains detailed suggestions about how this might be done, and they go on to speculate that Ficino himself went even further in practice than he was pre- pared to admit in print. Ficino goes on to describe the figures, or images, which represent the decans of the zodiac, shown by Yates to derive from Egyptian deities, described in detail in an ancient manuscript of magic, the Picatrix. These images, engraved in stones corresponding to the planets, might prove particularly efficacious. The effect also depends on the state of mind of the adept. Charged images that make direct links to these celestial energies and entities. This is the exact catalog of values that inhabits the universe of the Continental Tarots. The Planets, Signs, Aspects and Elemental dignities are canonized in the astrological writings of Ptolemy. The Elemental Trines were engraved upon the Western psyche by Raymond Lully. The “three worlds” scheme or triple septenary of the Trumps can be found in multiple places, including the Kabbalah Tree, Dante’s Divine Comedy and the Book of Revelations. The essential number theology informing the pips pack interweaves between the Pythagoreans and the Kabbalists. The body of correspondences linking the Trumps to the magical alphabet of Antiquity is hung upon the traditional Trump Numbers, and is detailed upon the Tree (below) in the Sefer Yetzirah. The particular arrangement of the Shem angels we are using first appears in the Clavicles of Solomon. And finally there is the extended visual and symbolic catalog attached to the angels and demons, drawn from the Picatrix. This richness of interconnected values is all right at hand by the 1400’s, for those who have an interest in such things, (which we can clearly see Ficino did). For this reason I can’t claim the card pack Tarot of the Holy Light as “my creation”. No creativity was required for me to pull these details together, only the perseverance to systematically map the magical universe of our ancestors and note the order in which these ideas appear on the historical stage. Neither the imagery nor the ideas we used are in any way new, though Michae Dowers’ fascinating collages have put it all into a fresh visualization for the 21st century. To my mind, THL is a revival of time-honored conventions, which happen to fit so closely into the Tarot outline because the cards were purpose-built to contain them. I simply can’t accept the fact that it is “synchronicity” or some kind of blind luck that the Tarot is so accommodating to astrology, alchemy, number theology, Kabbalah and the magical armature of the Renaissance magus. All of us in the 20th and 21st centuries are beneficiaries of this tradition and the stability it has showed through the millennia. But it is necessary to put down our modernist lenses and learn to look with the gaze of our esoteric ancestors if we want to see the design imperatives Tarot's originators built into it. This is what I am attempting to demonstrate with Tarot of the Holy Light, and its accompanying books. It appears that the whole family of Continental Tarots represent an inter-generational effort to distill the ancient Mysteries, the orderly process of Destiny as defined by the patterns inherent in Nature, into a set of guiding principles for human life. We look to Ficino as a role model for his times, but he drew from a considerable well of prior effort in order to arrive at his overview. After the embellishments that Jacob Boehme brought to the inherited model during the Protestant Reformation, the potential for using Tarot to qualify a body of astral and alchemical therapeutics went through the roof. No wonder the Masons and Rosicrucians were so eager to assimilate this worldview and enshrine it in their spiritual methodologies. It is Gershom Sholem himself who informs us that the Christian Kabbalists of the 17th and 18th centuries focused the lion’s share of their kabbalistic studies upon Boehme and his exponents. This is a reality that has gone utterly unappreciated by my contemporaries, a lack of awareness that severely distorts the current estimation of Tarot’s significance in the early centuries. But that’s enough bloviating from me at this juncture! What remains is for those who love Tarot of the Holy Light to read the current volume, and for me to get the next one out as fast as possible. I eagerly await the conversations that will result as other occultists take the time to study this overview and connect the dots for themselves. A whole world of advanced esotericism awaits those who are ready to “lock eyebrows” with our ancestral mentors. I’m excited about the potential for the world of Tarot. We were of course thrilled to read the excellent review from Benebell Wen here, which I hope you enjoy. Yet we have a slight consideration regarding the grey-scale illustrations, which I want to address in this venue so everybody can see these remarks. In the section of Illustrations that close out Chapter 1, some of the details that are visible in the full-colored images tend to wash out in black and white, dimming their significance. So I am going to supply those images here now. The Kindle edition of this book, when we get it through their process, will show the full color; in that case, this problem of washed-out greys won’t matter. But for those who want to truly visualize and internalize the details of the Cabalistic model, these fine distinctions are essential to understand. To the left is the map of the planetary Paths that vertically link the “three worlds” along the three uprights of the Kabbalah tree. There also exist planetary assignments made to the Sephiroth (the spheres at the joining points between the paths), but the focus of this diagram is the way the Planetary energies on the vertical Paths define the Three Pillars. Mars/Venus energies fill the Father Pillar, Jupiter/Mercury energies fill the Mother Pillar, and Sun/Moon/Saturn energies fill the Middle Pillar. These planetary associations are also important features of the Ladder of Lights (below), revealing important relationships that cross boundaries between astrology, alchemy, and Kabbalah. To the right is a presentation of the Signs of the Zodiac stretching along the diagonal paths of the Kabbalah, linking the Mother and Father pillars (left and right) to the Middle Pillar and carrying the momentum of the year down the body, from the crown of the head in Aries to the soles of the feet in Pisces. These two diagrams together, including the three horizontal crossbars representing the ‘3 Worlds’ or three primordial Elements, comprise the energy-body of the primordial Adam of the Gnostics and Kabbalists. This is our occult anatomy, looked at through the Western grid. To the left is the diagram called Upper and Lower Countenance, which focuses on the Planetary Sephiroth, namely the centers (spheres) linked by the paths. This diagram demonstrates how the Sun, Moon, Jupiter, and Mars Spheres touch into the upper world (connected to the Supernal Triangle, 1, 2, 3, in blue), while Venus, Mercury, Saturn and Moon are grounded into the lower world (signifying earthly and bodily life, 7, 8, 9, 10, in red). The intervening spheres affect both "worlds", qualifying the realm of the human Will. In this tradition, Jupiter teaches and organizes the influences of the Upper Countenance, while Venus teaches and organizes the influences of the Lower Countenance. Jupiter and Venus are the traditional 'benefics' of astrology. They share the work of the Father Pillar, which conducts gratitude and obedience to Heaven up the Tree. Mars and Mercury, in contrast, conduct "fire from heaven" (Divine correction, heavenly Wrath) down the Mother Pillar into the Creation. All three of the above diagrams represent Hebrew explanations of the ecology and hygiene of humanity "made in the image of God", before the disturbing events that shut down our aboriginal Eden and cast us into the world we currently occupy. Ladder colored chart IDTo the right is a representation of a very ancient esoteric model showing the Elemental Trines circling the Zodiac. These signs are internally ruled and related by the interior structure called the Ladder of Lights. This entire device occupies the center section of the THL Icon (shown in black and white in the Frontispiece). The three rectangles that link the planetary pairs illustrate the Doctrine of Essential Dignities andexplain the alchemical remedies produced by the regular motions of the Planets around the Zodiac. A consideration raised by Benebell Wen’s excellent review of the new book (here) had made me re-think my presentation of the two Tarot spreads in the Appendix. She is right, the spreads could use illustrations if I want them to be user-friendly for beginners. We are planning to meet this need in the next edition, which will be undertaken after the Foundations volume has become available. As the intervening time unfolds, I am keeping track of themes and subjects that require deeper treatment. I’m thinking that the Tarot of the Holy Light deserves to have a workbook or practice manual. Wen has hinted that she’d like to see more thorough explanations of the symbols found the individual cards, with notes on their origins and implications in the context of the collages from card to card. There is also the consideration raised by our copy editor, who asked me why there isn’t a glossary of important terms available for those with less exposure to the magical worldview. I also happen to have written two more chapters that had to be left out of the two existing volumes, for obvious practical reasons. The first is a running commentary on the historical personalities that make up the lineage transmission through the centuries, including how their contributions impinge upon the universe of the Tarot. The second drills down more concretely on the various astro-alpha-alchemical-numerical techniques a practitioner can apply to their own birth chart, allowing one to exploit the alchemical medicines to their fullest. To address all these considerations, I’d like to propose that I host a class this fall/winter in the interdisciplinary aspects of the Tarot of the Holy Light, with an eye towards forming a dynamite user’s manual to support practitioners in exploring the fuller implications of this amazing magical portmanteau. If there are any of my readers who would be interested in attending such a class, I’d be glad to use the internet as our venue so there’s no traveling involved for me or you. If you think you might be able to participate, write to me at christine@tarotuniversity.com, and I’ll keep you posted. We'll meet again for the NewMoon in Cancer. Wow, I guess I've been working on this topic a long time!